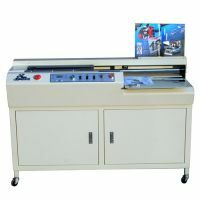 Removing the unwanted glue head and glue tail to reach the special requirement of non-cutting automatically. There will be no glue leave on the table. 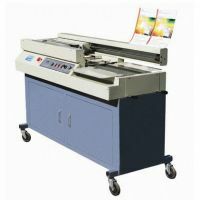 Makes the machines different from other products from the same industry; this technology effectively solves the problems of the cover curving as well as the clamp car carry off the cover when binding different thick books. 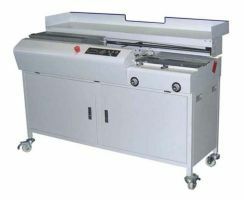 Adapt to different cover thickness, control book back forming radius arbitrarily. 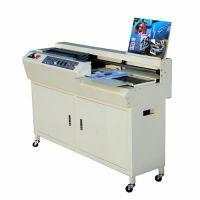 Taking and putting cover and books more conveniently, achieve taking books horizontally, greatly enhance the working efficiency. 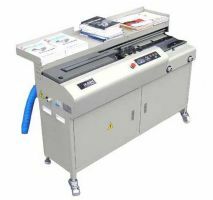 No need of auxiliary desk to place book core, cover and finished products, convenient and practical. Adopting intelligent temperature control and smoke exhaust design, which make working condition more environmentally-friendly and protect physical and mental health. 32-bit chips, powerful feature set and adopting the LCD screen display, intuitive, easy. 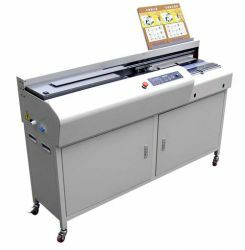 Self-test and alarm feature allow you to fully understand the machine working operation; milling cutter, glue roller auto-sensing open, self-closing, intelligent and convenient.